This a repost of an artical from tutorials point. Please checkout original post for the most update-to-date information. Unfortunately, not all computers store the bytes that comprise a multibyte value in the same order. Consider a 16-bit internet that is made up of 2 bytes. There are two ways to store this value. Little Endian − In this scheme, low-order byte is stored on the starting address (A) and high-order byte is stored on the next address (A + 1). Big Endian − In this scheme, high-order byte is stored on the starting address (A) and low-order byte is stored on the next address (A + 1). To allow machines with different byte order conventions communicate with each other, the Internet protocols specify a canonical byte order convention for data transmitted over the network. This is known as Network Byte Order. While establishing an Internet socket connection, you must make sure that the data in the sin_port and sin_addr members of the sockaddr_in structure are represented in Network Byte Order. unsigned short htons(unsigned short hostshort) − This function converts 16-bit (2-byte) quantities from host byte order to network byte order. unsigned long htonl(unsigned long hostlong) − This function converts 32-bit (4-byte) quantities from host byte order to network byte order. unsigned short ntohs(unsigned short netshort) − This function converts 16-bit (2-byte) quantities from network byte order to host byte order. unsigned long ntohl(unsigned long netlong) − This function converts 32-bit quantities from network byte order to host byte order. These functions are macros and result in the insertion of conversion source code into the calling program. On little-endian machines, the code will change the values around to network byte order. On big-endian machines, no code is inserted since none is needed; the functions are defined as null. Keep the following code in a file byteorder.c and then compile it and run it over your machine. 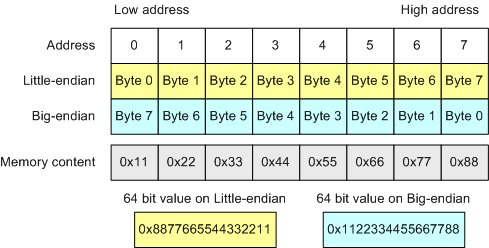 In this example, we store the two-byte value 0x0102 in the short integer and then look at the two consecutive bytes, c (the address A) and c (the address A + 1) to determine the byte order.